Lately the majority of cooking going on in my kitchen is all to do with baby food. Trying to come up with a decent selection of food my little one will eat and more importantly like, is actually harder than it sounds. But Every so often, usually on a Sunday, I get a few hours to do some recipe testing. 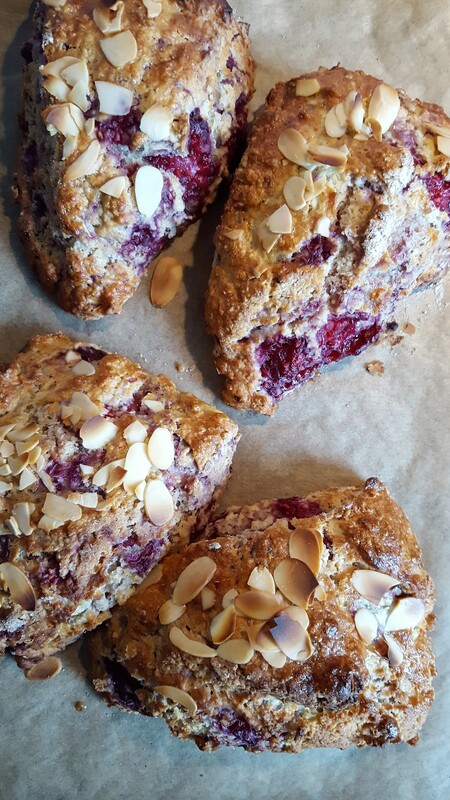 I have been dabbling with scones the last while. Giving me a) something to blog and b)something to eat during the week when the tiny window of opportunity presents itself. I try to eat when my son does, so he learns how to eat but it isn’t always possible. Take your eye off a 6 month old for a second and the dog gets a second breakfast and your child is still hungry. 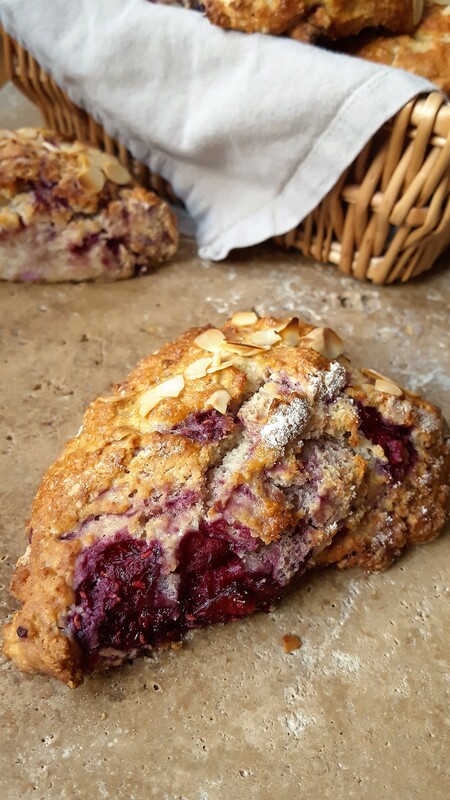 This is my favourite scone recipe to date. I hope you all love it as much as I do. I tend to play around with different berries and essences but this a really good combination. I make these with greek yogurt normally as it is always in my fridge, but natural yogurt is also just as good. 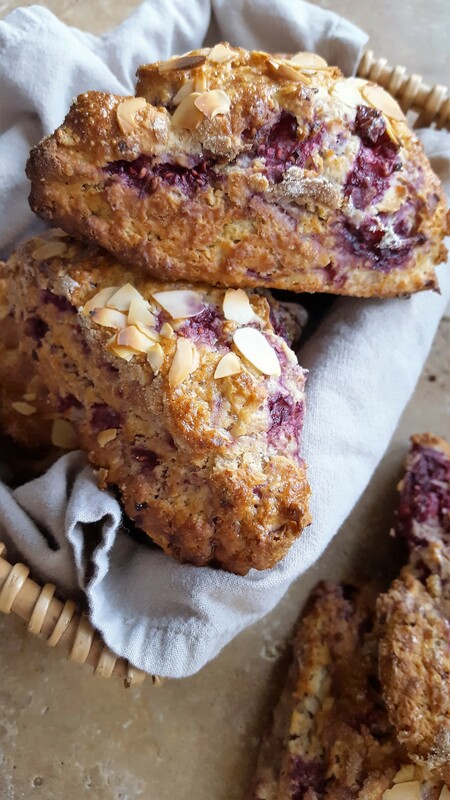 For this batch I actually used reduced sugar raspberry yogurt from Glenisk and they turned out exactly the same in texture and shape as my previous batches. 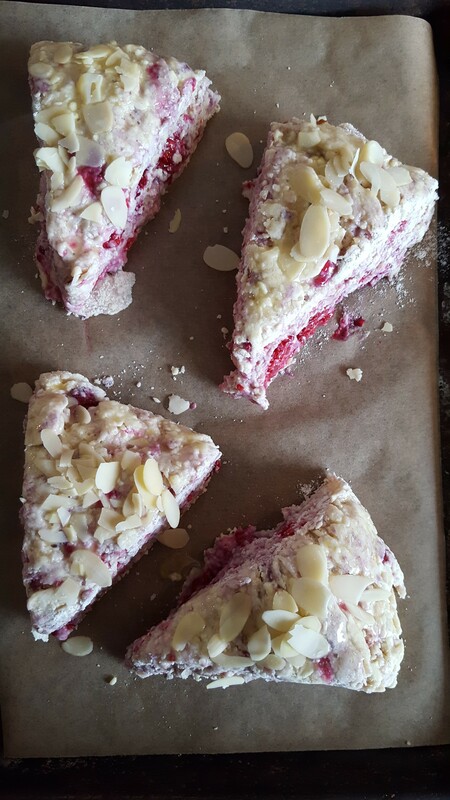 And had an extra added hint of raspberry. So basically any yogurt you may have should work. But if using a flavoured yogurt, they tend to be high in sugar so just reduce your actual sugar content by 10 or so grams. Heat the oven at 210 C (fan oven), and line two baking trays with non stick paper. In a food processor, put the flour, butter, sugar and baking powder and blitz until the butter is finely chopped and spread through the flour. Tip into a large bowl and add the frozen raspberries. 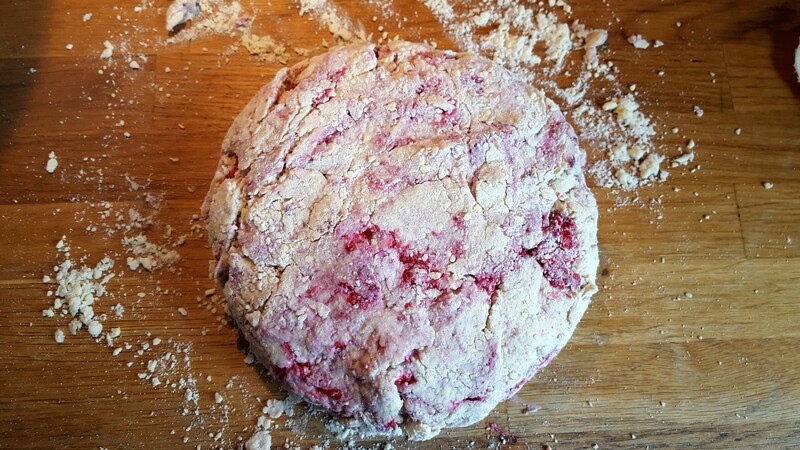 Mix them to coat the berries in flour and roughly distribute. Make a well in the centre. In a jug, mix the milk, yogurt and almond essence with a whisk. Pour the liquid into the flour and mix with a large wooden spoon or spatula. it doesn’t need to be perfectly all combined. If there is some flour not mixed in, that’s fine. Better not to have a sticky mixture. Tip onto a floured surface (if you have some flour in the bowl not mixed in then you don’t need to flour the surface). Gently draw it in with the palms of your hands cupped to make it a large disc and about 1.5-2 inches thick. Using a large sharp knife, cut in half, then quatre and then eighths. 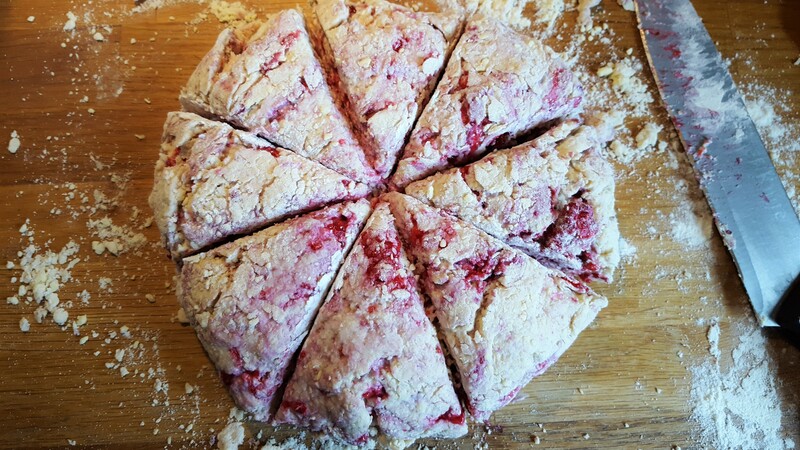 Pop the knife under each piece and transfer onto the baking tray. Beat the egg (if using) and brush the tops of each one, then sprinkle with almonds and pop into the oven for 20 minutes until golden brown. Allow to cool before removing from the tray and eating.